Coyotes are one of the most popular predator species in North America in large part because they are found in good numbers throughout a wide range and can be fairly easy to locate. Yet, even though it may be easy to access areas where coyotes are located, finding them and shooting them takes preparation and skill. Here are 6 tips to help you become a better coyote hunter. Especially during the winter, when fewer food sources are available, finding coyotes depends heavily on finding their prey. If you can locate areas with good populations of prey, you are on your way to finding coyotes. Food sources like rabbits, hares and other small mammals, or even livestock, will be what coyotes will be focusing on. Do some scouting before your hunt to find both food sources and signs of coyote activity. Concentrate on transition areas, such a place where woods meet farmland, or mountains meet valleys. 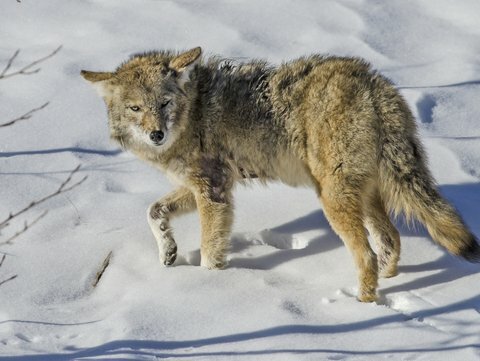 A good call and technique can be essential to drawing coyotes toward your location. Experiment with a few different calls to find one that best suits your style and technique. If you are a beginner, the closed reed call is probably the best bet. Open reed calls are better in cold weather and you can do more with them. Practice beforehand, so you are at your best when you hit the field. An important key to coyote hunting is to cover your scent. Coyotes have an exceptional sense of smell and if they catch your scent, they will be gone in a flash; then all of your hard work calling and drawing the animals toward you will be wasted. Taking the time to properly mask your scent will save considerable headache and improve your success. Knowing when to take the shot depends heavily on being able to read the coyote. The best time to pull the trigger, of course, is when you know you have a good shot, but if you understand coyote behavior, you may be able to wait for a better shot. When a coyote is moving toward you, watch what it does. If it stops and sits down or moves toward the side, it likely is not coming any closer to you, so shoot. However, if it stops with its head facing you, there is a good chance it will move closer, and you will have a better shot. Another important element in coyote hunting is camo. It is crucial to match your camo as closely as possible to your surroundings. This will help you stay hidden and reduce the chances that you will spook the coyote as it is moving toward you. Coyotes are naturally apprehensive and alert when moving in and anything you can do to reduce being spotted will be to your advantage. Select a location that helps you stay out of sight, but which also gives you a good vantage point to see all the terrain around you. Choosing an area near a tree or brush will reduce the odds of coyotes seeing you. Coyote hunting can be a lot of work, but putting these tips into practice will help you improve your coyote hunting skills and increase your odds for success, the next time you are in the field.